I promised you last week that this week would see our first WWW Indie polish and here she is - Private School by Pretty & Polished. I appreciate that for some of you, this polish may not be an option, but for those of you looking for a subtle, tasteful glitter with character, you may have found what you're looking for. 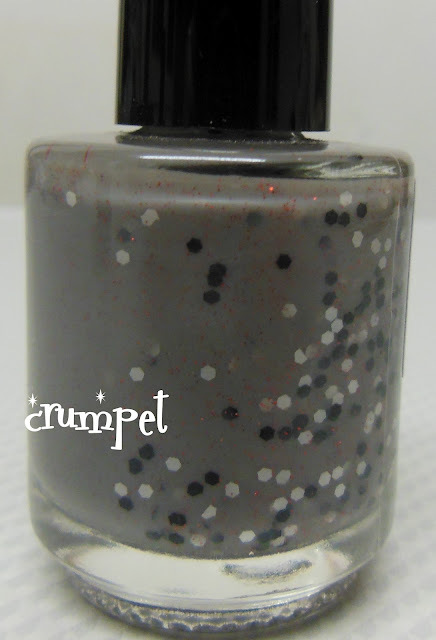 Private School is a taupe crelly (half creme, half jelly), which leans grey rather than brown. It contains liberal portions of white and black glitter, creating a really subtle glitterbomb. Best of all, the polish is laced with copper shimmer. I LOVE copper shimmer, it's one of my favourite things at the moment, and it adds an unexpected twist to this polish, giving it its only flash of warmth. This is not the type of polish I usually buy, but something about it spoke "autumn" to me. I wore it on a drizzly day, and it couldn't have been more perfect!